Arcann escaped death during the Battle of Odessen, but you ultimately tracked him down on Zakuul--and destroyed him. Arcann began his brutal reign with the assassination of his own father before spreading untold death and suffering throughout the galaxy. Eventually defeated by the Outlander and stripped of his throne, Arcann initially sought revenge... but the mercy shown to him and his mother by his hated enemy profoundly changed him. Now Arcann fights at the Outlander's side to liberate the galaxy from Zakuul in the hope he can atone for the monumental sins of his past. While the rest of the Dark Council fought the Eternal Empire--and each other--Darth Acina was smart enough to step aside and patiently wait for the right moment to make her move. When she saw the opportunity to side with Arcann to ensure the survival of her people, she took it. Similarly, when the rise of the Outlander's Alliance offered her a chance to break free from Zakuul, she acted quickly. Recognizing their common interests, Acina seeks a partnership that will usher in a new era of mutually beneficial coexistence. Short, squat humanoids, Gamorreans are easily identifiable by their greenish skin and porcine features. On their homeworld, they live in clans, where the male boars serve exclusively as warriors while the female sows tend the day-to-day affairs like farming, raising young and crafting weapons. Known for their physical strength and endurance, Gamorreans are generally considered a species of below average intelligence. Unable to speak Basic because of their physiology, most Gamorreans are still able to comprehend it and find a place in the galactic community as soldiers, guards or mercenaries. Due to their reputation for violence and brutality, they are often employed by crime lords, gang leaders and various other criminal elements. Darth Hexid is a connoisseur of the dark side. Renowned for her brutal combat prowess and decadent lifestyle, she enjoys the many pleasures of a celebrated Sith, whether savoring exotic feasts held in her honor or hunting down her foes as they flee in a panic. Instead of joining the political infighting of her Sith peers, she amuses herself by watching their rabid power games from the sidelines--lightsaber in one hand, spice wine in the other. Darth Hexid earned infamy following her devastating triumphs in the Great Galactic War, but it was the Sith Order's crushing defeat at the hands of Zakuul's conquering army that forever defined her. She now pursues the complete annihilation of the Eternal Empire. Vengeance will be hers, even if it demands a pact with the Outlander's Alliance. 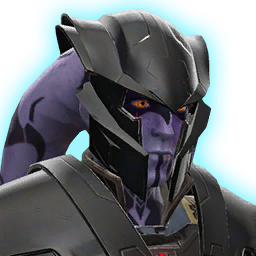 Dramath is the father of Tenebrae, the child who would become the Sith Emperor and later Valkorion, Immortal Emperor of Zakuul. Lord Dramath was killed by his son and imprisoned within a holocron for eternity. Master Ranos has always walked her own path, turning her back on the Jedi Council to follow what she calls "the will of the Force." A true champion of the light side, her journey led her to the farthest reaches of the galaxy, where she used her formidable skills to serve and protect those on the dangerous frontiers of galactic civilization. But now the Force has given her a new purpose: join the Outlander's Alliance in their battle against the Eternal Empire. An infamous bounty hunter and deadly warrior, Shae Vizla forged her reputation more than 20 years ago by allying with the Sith Empire against the Jedi and Republic. She reluctantly took up the mantle of leadership for her people after the rise of the Eternal Empire and the death of Mandalore the Vindicated. Declaring herself Mandalore the Avenger, she now works with the Outlander's Alliance to break Zakuul's iron grip over the galaxy. Paxton thinks of himself and his crew as adventurers seeking glory, fame, wealth, and excitement. Most people would just call them pirates. Whatever they may be labeled as, one thing is certain: they are one of the most capable starship crews in the galaxy, and Paxton one of the finest captains. He's led his crew to every corner of the galaxy taking on any job, but only if it was exciting and the payday was good. His wandering eye has landed on the Alliance as a potential new client worthy of his standards, so Paxton is determined to achieve new heights of fame and fortune by fighting at the Commander's side. Sprays waves of ionizing energy in a 10-meter cone, dealing <<1>> elemental damage to up to 5 enemy targets. Unleashes a scattergun attack that instantly deals <<1>> kinetic damage and another <<2>> kinetic damage over 6 seconds. In addition, the target is sundered. Sundered targets have their armor reduced by 20% for <<3[%d seconds/%d second/%d seconds]>>. Electrocutes the target and energizes the companion, dealing <<1>> energy damage and healing the companion and any allies around them for <<2>> health. In addition, standard and weak targets are stunned for <<3[%d seconds/%d second/%d seconds]>>. Tosses a Kolto Dart at the target, healing for <<1>> health. Fires a scattergun at point blank range, dealing <<1>> kinetic damage, generating additional threat, and forcing the target to attack your companion for 6 seconds. Storms the target with a hidden knife, leaping to the target, dealing <<1>> damage, generating a moderate amount of threat, and immobilizing the target for <<2[%d seconds/%d second/%d seconds]>>.